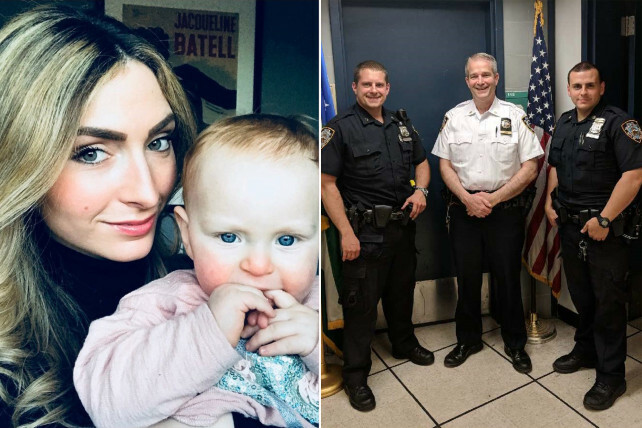 Four of New York’s Finest rushed to the rescue of a baby girl suffering a seizure Saturday night in Brooklyn, pulling the tot back from the brink, according to her grateful mom. Caroline Ivanov was celebrating her mother-in-law’s birthday at a restaurant near Ocean Parkway and Brighton Beach Avenue around 7:10 p.m. when her 15-month-old, Chloe, suddenly started convulsing, became breathless, and turned blue. Ivanov dashed out of the restaurant screaming for help, spotted a 60th Precinct police car stopped at a red light, and ran over, frantically pounding on the window for help. Officers Michael Pace and Joseph Doyle, both 26, quickly radioed for an ambulance. Two nearby transit cops, Officer Daniel Newman and Lieutenant Patrick King, heard the call come over the radio. “I thought, ‘I have to get there,’” said Newman, 29, also a certified EMT. Now joined by Newman and King, Pace returned to the radio to ask how far out the ambulance was. The reply was seven to eight minutes — time the cops decided that young Chloe couldn’t spare. The four cops plus the Ivanovs sped off in the patrol car towards the hospital, with Newman performing CPR on Chloe in the backseat.